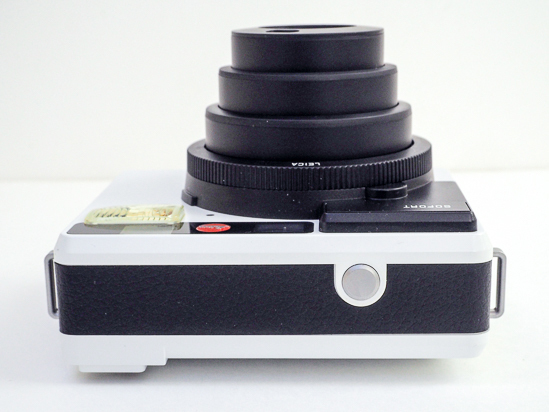 The Leica Sofort is a new instant film camera. Numerous modes and options are available on the camera, as well as creative programmes for multiple and timed exposures. For easier ‘selfies’, the Leica Sofort features a rectangular mirror on the front, and the focusing distance can be set independently from the selected programme mode. In addition to colour film, Leica also offers a monochrome film option. 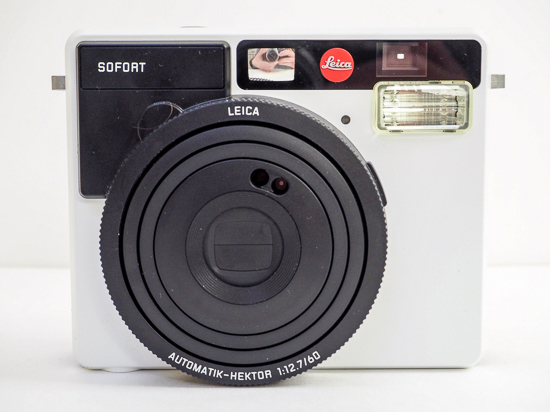 The Leica Sofort instant camera is available in a choice of white, orange and mint at a suggested retail price of £215 including VAT / $299 in the US. It would be easy to become jaded in writing about cameras if each successive generation merely involved the proverbial nip here and a tuck there. However, the new Leica ‘Sofort’ (not a reference to battlements, but rather German for ‘instant’) is something refreshingly different: it’s the premium brand’s first-ever instant print analogue camera – the launch of which adds a welcome dose of almost frivolity to a previously oh-so-serious brand image, one largely built on both a very distinguished heritage, but also those high-ish price tags. 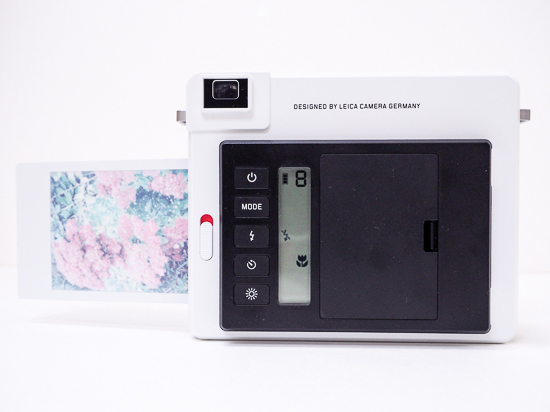 So is this possibly the most plush consumer-orientated instant camera there has ever been? 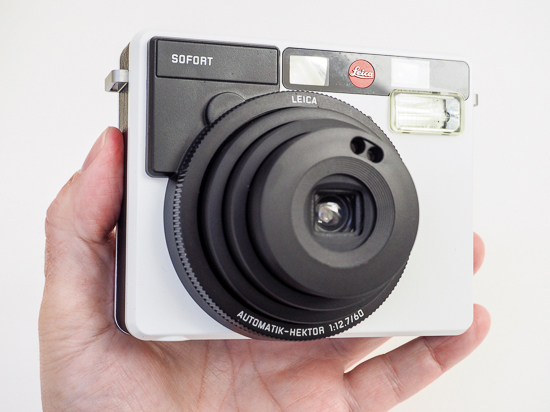 Sharp eyes will have spotted that the Sofort bears a very close retro-styled resemblance to the Fuji Instax Mini 90 – and indeed the Leica is able to utilise the Fuji’s Instax film packs, which work out at around a pound a picture/print. At the time of writing there are also Leica branded film packs coming that, like the Instax range, include a monochrome film option to broaden the appeal beyond the happy snapper brigade. 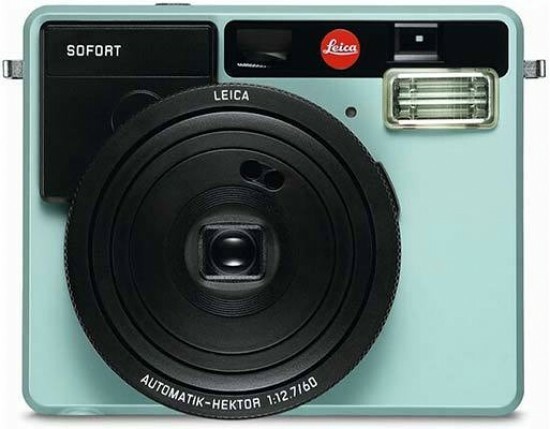 At a manufacturer’s suggested £230 however, the Sofort is twice the price of an equivalent Instax (the Leica film packs are also a pound dearer). However the other point to make is that such cost is still relatively inexpensive as far as owning a camera with that iconic red Leica logo is concerned. It’s worth bearing in mind that this Leica produces miniature credit card sized instant prints (at 62x46mm) smaller than the output from the old Polaroid instant cameras we’re familiar with from our childhoods. Undoubtedly, though, there is still the same thrill to be had from such chemistry and analogue simplicity, and in watching the finished image slowly emerge before our eyes. For those of us who were children of the 1970s and 80s, and recall the old instant consumer cameras (with their bigger prints and bulkier bodies) from the first time around, there is also inevitably a whole heap of nostalgic charm guiding any purchase decision. As well as being available in a ‘classic’ white finish – the version we received to look at – the Leica Sofort comes in the choice of two further, less stark, contemporary options: orange and mint. Why does this matter? Well, because owning this Leica is as much of a fashion – or, perhaps, status – statement as it is a practical consideration. Our review unit also came with a Leica branded neck/ shoulder strap, which can be bought separately for £15. The use of said strap is wise, as the physical size of this boxy camera at 122x94x58mm means it’s not one for being able to otherwise easily slip into a jacket pocket, or handbag. Without rechargeable lithium ion battery or film inserted, the camera weighs a fairly standard 310g, so it’s certainly light enough to be conveniently transported however. As the product shots indicate, the design of the Sofort is very square and hard-edged, partly down to the fact that this is indeed a camera and printer combined. It’s a bit like a child’s drawing of a camera, the simplicity of its layout being again, we guess, part of its charm. Inspecting it from the front, we get a window for the viewfinder, a small mirror to aid with the composition of the inevitable selfie, and a large flash window, top right of the lens, sitting just beneath the optical viewfinder. For those more used now to using screens to compose and review images, the compositional viewfinder appears tiny – but then again we’re probably not going to be peering through it for extended periods of time; this is a camera for picking up, taking a snapshot and handing on to somebody else to do the same. Keeping things simple in such social circumstances, the only control on the camera’s top plate is a shutter release button. The actual power button is kept out of the way of accidental activation, being located on the backplate. It’s the top control in a vertically stacked row of five, nestled next to a tall and narrow LCD window that reveals the operational settings chosen via simplistic icons. Like the buttons themselves, these are again presented in a stack, the top self-explanatory setting being an indicator of the number of shots remaining. Press the activation button and the camera is quick to power up, ready for action in a couple of seconds, as the lens whirrs from its internally stacked storage position to its fully extended setting. The 60mm lens with f/12.7 aperture provides the focal equivalent of a 34mm lens in the 35mm format; in other words a reasonably close approximation to what we see with the human eye. Surprisingly perhaps for what is essentially a point and shoot camera, there are two fixed focus stages, selected by using the lens encircling focus ring, as well as a macro/close up setting selectable via a press of the mode button on the camera back. Squeeze the shutter release and almost immediately we’re rewarded with a familiar, distinctly analogue whirr as a virgin white print emerges from the side of the camera, dry to the touch. It takes a few minutes for the image to slowly and fully emerge from said print – but such anticipation is surely a large part of the fun. We’re not 100% sure what we’ve captured – in part due to the eye strain-inducing small optical viewfinder – until the print fully reveals itself to us. On the rear LCD panel we are given indicators of the camera’s power status/battery life, plus the aforementioned picture counter – counting down from the 10 shots available in each pack – plus the focus setting – with a twist of the front ring allowing adjustment from 0.6 metres to three metres, or three meters to infinity, complete with a motorised whirr as adjustment is made. We also get selectable picture modes, including the options of self-portrait, people/party scenario, action and sport, close up, double exposure and bulb (long exposure) settings. Finally, at the bottom of the five-user operable buttons there is a brightness setting. Flash settings range from automatic to fill-in flash/always on, to flash plus red eye reduction, and finally to off. We also get a self-timer setting of either the standard 10 or two seconds delay. Automatic exposure control is a claimed equivalent of ISO800 (the Instax film packs provided are ISO800). To the left of the row of buttons is a slider switch for opening the camera back, allowing the film pack to be inserted. When the film is inserted and the camera is in use a red indicator is shown just above the switch, to presumably warn against opening the camera back – though it also inadvertently acts as a ‘what does this button do?’ lure for the fingers of younger family members. Overall the Leica Sofort’s build is otherwise solid and not overtly plastic-y, though the boxy build may be a love-it-or-hate-it ‘Marmite’ moment for many. Power is provided by the rechargeable BP-DC17 lithium ion cell provided, which slips under a thin flimsy feeling plastic cover at the rear is good for 100 shots, according to the manufacturer. A simple charger and mains plug is provided in the box for replenishing your supply.